It seems not to have occurred to the council that the existing tree canopy has supported the very conditions that enable such a diverse flora to thrive. In other words, they have already become a component part of the “naturalness and diversity” of the Birks, the very thing the council seeks to conserve and foster. Besides, the beech has been in Scotland since the mid-18th Century, about the same time as the planting Dukes of Atholl set to work to create an almost wholly unnatural, non-native forest, which the same Perth and Kinross Council now flags up to the tourist industry as Big Tree Country. It was many decades after the arrival of the beech in Scotland before one of the council’s much-vaunted local heroes, David Douglas of Scone, began bringing Sitka spruce and redwoods back to Scotland, and stirred them into the mix of our woodland cover. So is the council only interested in really big non-native trees or is it just beeches they don’t like? Well, at the Birks they also have sycamores and Norway spruce in their sights as part of their relentless pursuit of “naturalness and diversity”, this despite the fact that these species have long since seeded naturally there and, by their very presence, have added to the diversity. But if only big non-native trees are welcome here, consider the following assessment of world authority Hugh Johnson in his majestic book, Trees: “The sycamore is the giant of the maple of the family. It is also the beanstalk: it reaches full height in 60 years. 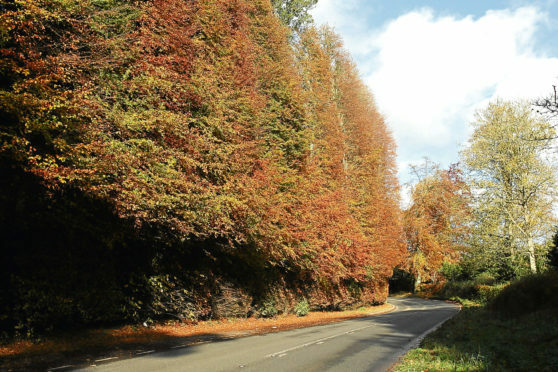 So any day now, expect the council to announce (with regret) to the beech tree-loving world that in view of its idealistic pursuit of “naturalness and diversity”, that a 580-yards-long wall of trees will have to go. But, then, it’s been there since 1745 so you can’t say you haven’t had plenty of opportunity to go and visit it. It is around this point in any examination of council policy that rational human beings stop being puzzled and get angry. The Birks of Aberfeldy are beautiful. Everyone who walks there says so, whether they live in Aberfeldy and walk there several times a week every week of their lives or whether they have been urged there on a whistle-stop Highland tour by VisitScotland or indeed, Perth and Kinross Council. The thing is, they like the beeches, and so does the wildlife of the Birks. Why do we always assume that we know better than nature? Why do we insist that our idea of what is natural and diverse is better than nature’s? The beech is here. It has been since Jacobite times. As an individual tree, it is both a natural monument, and in the particular case of “the monarch of all hedges”, a historical one. In order to make the Birks “natural”, you would have to remove the sign posts, the car park, the paths, the staircases, the bridge, and the statue of Burns, and you would have to remove the whole place from tourism literature to avoid artificially inflating visitor numbers. And the beeches would still find a way in if nature wanted them to. If Perth and Kinross Council wants to do something useful for the naturalness of its woods, how about abandoning proposals to close recycling centres, thereby preventing the widespread fly-tipping that would ensue, naturally.